With ingenuity and luck, a wilderness mishap turns into a romantic adventure where love has room to bloom! A short novel. Though he lives as an openly gay man in DC, Nick decides to revert to his closeted alter ego when he returns home to Colorado. Someday he’d come out to his family – in six months, maybe. Or six years. Now he steels himself to survive a back-country camping and hunting trip with his brother and friends. But Nick forgets he isn’t out East anymore when he kisses his hot skiing instructor just as his brother arrives! If the awkward silence on the drive up is bad, the constant stream of gay jokes by his brother’s friends is even worse. 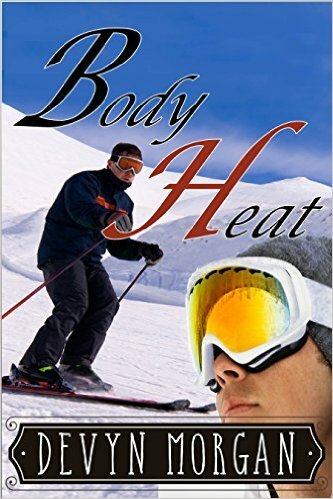 Clay likes his skiing student a lot – enough to exchange phone numbers despite his sulking brother and the pile of hunting gear in the back of their truck. Nick is smart and funny and incredibly cute. Clay texts to invite him to dinner, only to find Nick is still out on the mountain and at the mercy of the elements. When a winter storm threatens, Clay resolves to rescue Nick personally. He thinks Nick is “the one” – but only if their new relationship survives the close quarters of a cozy snow cave. Oh my goodness I love to find stories set in Colorado, especially if they feel like the author knows the area. Devyn Morgan does. I felt like this story could have been in the news this last winter, except how many of those stories have happy endings? This one does. Poor Nick, not only has he accidentally outed himself to his brother and his companions, he’s gone and fallen into a tree well. The snow falls around the evergreens but not under, it makes a pit that’s easy to get into and hard to get out of. If no one knows you’re there, you might be there until next summer when the hikers find your bones. This unfortunately is a feature of our local news. This story doesn’t make light of a really dangerous situation, but does use it to bring the two potential lovers together. Nick manages to summon help and has enough gear with him to survive for a bit. Clay races to the rescue, but due to conditions, has to stay with Nick in their My Side of the Mountain accommodations. Things are serious, but the author promises us a happy ending and gives it to us, but not without making us suffer a little with the characters.